An earlier blog in this series by Suvidya Foundation, Bangalore, discussed the details of the EducateZilla program for rural government schools. Suvidya Foundation, Bangalore is a technology NGO working to improve the quality of education in rural government schools through the use of technology. At the time of this writing, Suvidya Foundation is successfully running its EducateZilla program using the Textbook-on-tablet technology in 35 rural government schools in Karnataka. Suvidya Foundation hopes to extend the program pan India. 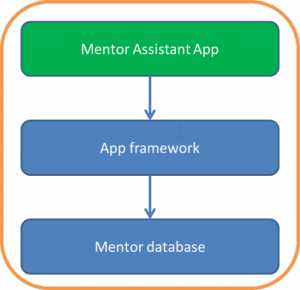 This blog describes how the EducateZilla program is using technology to help the mentors in the field carry out their tasks. Like many other NGOs working in the field of education, Suvidya Foundation has adopted the model where its trained mentors visit the schools regularly. In the EducateZilla program, local candidates, especially local women, with at least a graduate degree are offered the role of mentors. The mentors receive monthly honorarium from Suvidya Foundation. Suvidya Foundation, being a technology NGO, naturally uses technology to assist its mentors with their field work as well as to train them. Each mentor gets a tablet loaded with a field operation tool called the Mentor Assistant App (MAA) that automates a lot of tasks in the field, such as marking the mentor’s attendance at a given school, updating tabs at school with software/content, preparing class level performance charts and so on. The tablet also contains the Textbook-on-tablet solution along with special mentor training modules. The MAA constantly reminds the mentors to undergo regular training as per an automated schedule and tracks their progress. Each mentor is assigned 5-10 schools and is required to visit 1-2 schools every day. During each visit the MAA helps the mentor to take inventory of the hardware in the school. Mentors play a major role in hardware management through prompt reporting of any issues they notice or come to know of. They also facilitate transport of hardware to and from the Suvidya office, for service/replacement. Suvidya Foundation trains its mentors to teach the children to self-learn using the Textbook-on-tablet technology. Mentors conduct tablet assisted learning sessions during which they train the children to use the rich feature set of Textbook-on-tablet in small instalments so as not to overwhelm them. While they encourage each child to fare better by setting a target appropriate for his / her learning level, they spend quality time with slow learners helping them catch up with the rest. Mentors conduct round the year, on-site training for teachers using the teacher training module provided on their tablet. Bringing training to the teacher’s doorstep is another novel idea from Suvidya Foundation. Mentors kindle a competitive spirit in teachers by sharing with them the usage and performance charts from schools in the neighbourhood that are outperforming their own school. Mentors observe and report about teachers who are actively participating in the program and using the Textbook-on-tablet innovatively in class so that Suvidya Foundation could recognize them at the end of the year. Mentors are trained to identify and report any issues or changes that may potentially reduce the impact of the program at any school so that corrective actions can be taken at the earliest. Periodically all the reports from the mentors, including their training reports, are consolidated and analysed on the server to facilitate timely course corrections. It uses GPS to automatically record the attendance of the mentor at the schools that are assigned to him/her. It allows assignment (or re-assignment) of children to different tablets at school. It obtains software/content updates from cloud server and distributes the same to the tablets at school. 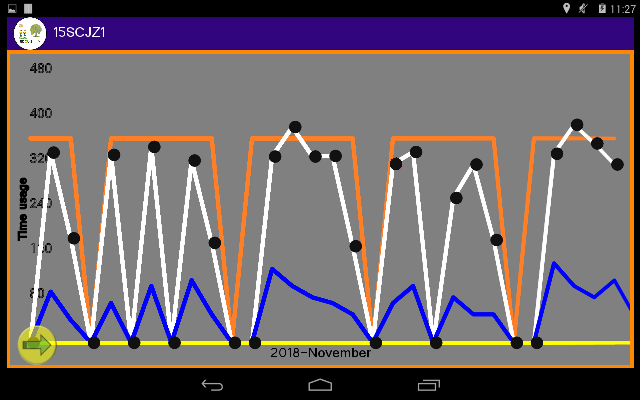 It collects the performance data from the tablets at school and delivers the same to the cloud server for analysis. Based on the data that it receives, it auto-generates various reports and charts to help the mentors focus on slow learners and underperforming schools. 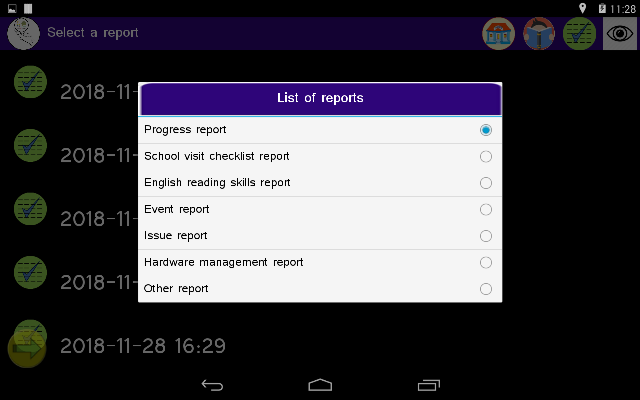 MAA provides simple templates to allow mentors to easily log issues and report progress during school visits. In summary, while helping the mentors with in-school program management, this tool also brings in better accountability for their work in the field. The following pictures show the various reports compiled or generated by the MAA. Like everyone else, the mentors in the field need to be motivated as well. The following are a few major aspects of the EducateZilla program that act as motivators for them. The fact that they use technology for their work adds to their motivation. First, being a part of the EducateZilla program makes them not just workers but change makers. This notion really inspires the young graduates who join the program as mentors. Suvidya Foundation puts a lot of effort into training them to get better at their work each day, to sustain the motivation. Having a tablet in hand not only makes them look tech savvy, but also offers them ample opportunities to improve their own knowledge of Mathematics and English as well as to develop better reporting skills. This in turn gives them the self confidence to take on new challenges. Second, using the performance reports shown earlier, mentors are awarded bonus points per school for various achievements by the children such as good usage, number of distinctions, frequency of meeting the targets and so on. These performance reports are generated by MAA four times a month and are available for the mentors to review helping them focus on schools that are lagging behind. Being fully based on the hard data from the field, the whole process is transparent. Mentors are also duly awarded bonus points for any initiatives that they take to resolve issues in the field or the innovative measures they come up with to motivate the children and their teachers. Based on these points the mentors are given bonus and recognition at the end of the academic year. Third, each mentor is assigned 5 schools to start with. As the schools begin to show significant improvement more schools are assigned to the mentor. The honorarium being dependent on the number of schools that a mentor manages, it is financially a motivating factor for the mentor to ensure better performance in his /her schools. Suvidya Foundation makes sure that any feedback from the mentors about enhancements to existing features or new features required in MAA or the Textbook-on-tablet is given a serious consideration and incorporated at the earliest opportunity. Having their opinion count is certainly a great motivator for the mentors. Last, and the most important, the rural children consider the mentors a gateway to a new world of knowledge and hence adore them. This immensely motivates the mentors to work harder for the children. Watch this space for our blog on how adopting a mixed medium of instruction might create a win win situation for our rural schools. © 2019 Suvidya Foundation, Bangalore	- Theme: Patus by FameThemes.